I’ve got the jitters. Not the back-to-school jitters. Not the end-of-summer jitters. Another thing we discovered is she loves milk. And she would rather have milk with her lunch than a juice box. You may recall I once scoured the grocery aisles of several grocery stores looking for milk in Tetra Paks to no avail. And then Milk Unleashed contacted me and my problems were solved. TORONTO – (August 14, 2013) – Twinkies may be back on store shelves, but they are not the best thing to put in kids’ lunchboxes! If your child’s lunchbox needs a makeover, follow the Five Cs for tasty and healthy school meals. 1. Convenient – A package of string cheese is just as easy to toss in the lunchbox as a bag of salty, fatty potato chips. So is a box of raisins. And shelf safe milk. Keep some single-serve cartons in the freezer – then nestle one in the lunchbox, and they’ll keep the other items chilled until noon. Since healthy can be so easy, vow to pass on the junk! 2. Colourful – Research shows that kids eat with their eyes, and many colourful foods are healthy options. Like baby carrots, red grapes and bright green edamame. Buy the red or green tortillas for wraps. Or make some pasta salad with colourful corkscrew noodles. 3. Cut Up – Youngsters are much more likely to eat an apple (and other produce) if you cut it up for them. Especially if there is something to dip the wedges in…like peanut butter or yogurt and honey. Try cutting a sandwich in four strips or little triangles. Or make a mini kabob with rolled up lunchmeat, grape tomatoes and chunks of cheese on a toothpick. ← I love this idea for mini kabobs! 4. Cute – Use a cookie cutter to shape a sandwich or vegetable slices. Get some fun printed napkins at the dollar store. Draw a smiley face on a banana. Need more ideas? Click here. 5. Cow – Embrace the cow! Dairy foods are packed with nutrients. Just one carton of shelf safe milk has 9 grams of protein and plenty of calcium and vitamin D. It’s just the right beverage to help kids learn and play all afternoon. For an entire month’s worth of ideas for your lunchbox makeover, download the latest Cow Calendar. From August 14 to September 10, enter the Lunchbox Makeover contest. 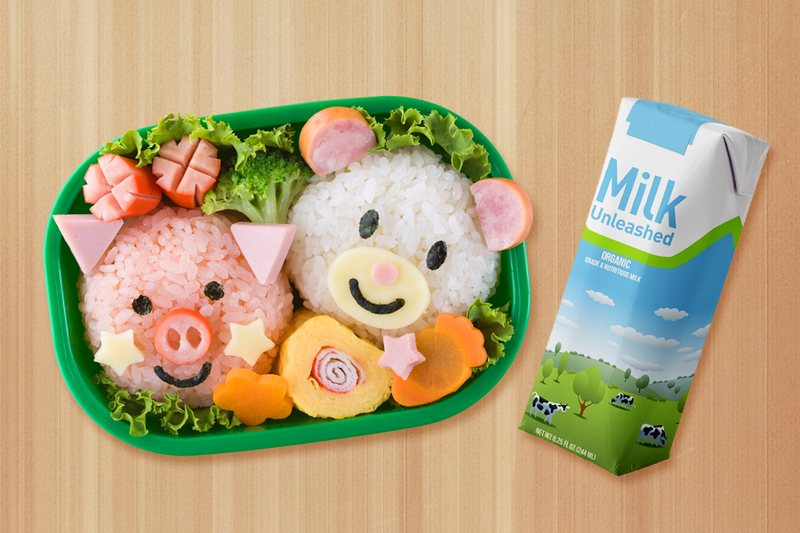 How do you jazz up your kids’ lunchbox? Submit a photo or description of your most creative recipes and lunchbox ideas for a chance to win. Hint: Follow the Five Cs above for a winning entry. Need inspiration? Visit Milk Unleashed on Pinterest. Learn more about Milk Unleashed (Le Lait Sans Limite) – it is shelf safe, Grade A milk that doesn’t require refrigeration until it’s opened (no preservatives added) and can be stored in the pantry for up to six months without refrigeration. This entry was posted in Uncategorized and tagged back to school, contest, Food, healthy school meals, kids, Kids, lunches, Media, Milk Unleashed, parenting, Parenting, picky eaters, Shelf Safe Milk, Tetra Paks on August 28, 2013 by Nancy. Good luck finding the right food to pack. My younger son told me he is excited for first grade because of his Despicable Me lunchbox. Crazy – right? I really enjoy reading your blog, Nancy! Do you know where you can buy Milk Unleashed? Hi Christina. Here’s a link to the different kinds that are available: http://www.milkunleashed.ca/where-to-buy/brands.html. I’ve seen them at the Superstore and No Frills in my area.